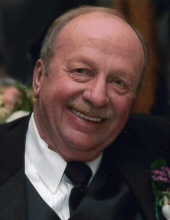 Celebrating the life of Richard "Rich" Bielema Jr.
Obituary for Richard "Rich" Bielema Jr.
RICHARD “RICH” BIELEMA JR., 76, OF El Paso, IL, died Friday, March 29, 2019 at Serenity Hospice and Home in Oregon, IL. Cremation rites will be accorded; there will be no visitation. A private family Celebration of Life will be held at a later date. The Morrison Chapel of the Bosma-Renkes Funeral Home is in charge of arrangements. Rich was born February 27, 1943, in Morrison, IL, to Richard A. and Henrietta (Hook) Bielema. Rich served in the Army National Guard. He married Sherry Swanson on March 21, 1986 in Bloomington, IL. She died on December 11, 2015. Rich worked for Universal Chemical in Maryland Heights, MO. He was a keen golfer and was a member of the El Paso Golf Club. He enjoyed working out in his yard and he was an avid Chicago Cubs and Bears fan. Survivors include two daughters, Darcy Bielema and Tiffany Bielema; three step-sons, Jeff (Laura) Johnson of South Beloit, IL, Erik (Lisa) Johnson of Wheaton, IL, and Jon Pitts of Georgia; three grandchildren, Alexa, Jacob and Sophia Johnson; one sister, Mary Lou (Gary) Huitink of Little Rock, AR; three brothers, Arnold (Marilyn) Bielema of Prophetstown, IL, Vernon (Joyce Augustus) Bielema of Prophetstown, John (Jeanette) Bielema of Hooppole, IL. Rich was preceded in death by his parents; his wife, Sherry; two sisters, Ruth Ellen Bielema in infancy, and Rena Newman. To send flowers or a remembrance gift to the family of Richard "Rich" Bielema Jr., please visit our Tribute Store. "Email Address" would like to share the life celebration of Richard "Rich" Bielema Jr.. Click on the "link" to go to share a favorite memory or leave a condolence message for the family.